I write to inform you of a possible problem with the latest issue of the Journal of Asian Studies (vol. 64#2). It has come to our attention that on a significant number of copies the front matter and first 20-odd pages of the JAS have been replaced with a section of the journal "Ancient Christian Commentary on Scripture" during the printing and binding process. Being an overseas member, I haven't yet received either my copy of the first print or the reprinted copy that the association has decided to arrange. Wonder if the misprint will become a collectors's item as happens sometimes with stamps. No? Really? 한국에서 요교부를 통해서 벌써 지난 15일에 밝혀진 일이지만 핀란드경찰이 오늘까지 발표를 안 했으니 나도 언급하지 않았다. 이 외에 내가 아는 것이 있느냐는 데에 대해서 완전 노코멘트다. 핀란드어로 된 뉴스는 국립방송국의 뉴스사이트에 있다. 덧붙임. 방송국 뉴스페이지엔 영어 레포트도 있다. (서울=연합뉴스) 이상헌 기자 = 한국인들이 중국인들의 핀란드 불법입국을 지원한 혐의로 핀란드 경찰에 잇따라 체포돼 조사를 받고 있다. 15일 외교통상부에 따르면 7월1일 러시아에서 국경도시 발리마를 통해 핀란드로 들어가려던 한국인 A씨가 함께 입국을 시도하던 중국인들의 불법입국을 지원한 혐의로 현지 경찰에 붙들렸다. 검문에 걸린 중국인 여성 3명이 한국 위조 여권을 소지하고 있었던 데다 장씨와 함께 입국하려 했다고 진술해 혐의를 받게 된 것. 그러나 장씨는 혐의를 극구 부인하고 있는 것으로 전해졌다. 이어 7월 초 B씨가 같은 경로로 핀란드에 입국하려다 역시 같은 혐의로 경찰에 체포됐다. 외교부는 현지 대사관을 통해 사건의 진상을 파악 중이다. 외교부 관계자는 "중국인들의 해외 밀입국이 잦아 관련국의 감시가 강화되고 있어 신뢰도가 높은 한국여권을 위조하는 일이 종종 발생하고 있으며 이 과정에서 일부 한국인들이 돈을 받고 불법입국을 지원하는 경우가 있다"고 말했다. 이에 따라 핀란드 당국은 러시아를 통해 입국하려는 한국인들에 대한 국경 검문을 한층 강화한 것으로 전해졌다. 이 관계자는 "여권이 낡았거나 여권상 사진 부착상태가 양호하지 않은 경우 새 여권을 발급받는 것이 바람직하며 국경에서 입국 심사 시 여행목적과 일정에 대해 문의받을 경우 상세히 설명해 주는 것이 필요하다"고 당부했다. Finnish police have detained two South Koreans whom they say are part of a human trafficking ring. Authorities believe the men are part of a criminal gang that has been transporting young Chinese women through Finland to Italy. The men were stopped earlier this month in separate incidents at a port in Helsinki and at the Vaalimaa crossing point on the Russian border. Police say the organisation has used forged Korean passports as part of an extensive human smuggling operation. Police Superintendent Jussi Hyysalo of the National Bureau of Investigation says that the women owe the smugglers as much as 20,000 euros for passage to Europe. This debt must be paid off after they reach their destination through indentured servitude. However there is not enough evidence to charge the smugglers with human trafficking, which would bring harsher sentences under Finnish law. Finnish police have so far detained about 10 people this year on suspicion of smuggling Chinese nationals through the country. Most of them have already been convicted of aggravated arrangement of unlawful entry into the country. The women involved have been returned to China. Commenting on the detentions, Interior Minister Kari Rajamäki said that the crimes of human smuggling and unlawful entry are not always taken seriously enough in this country. Rajamäki warned that a negligent attitude could lead to punishment of the victims while the truly guilty parties get away. He called for a more open discussion of these crimes. Prevention of illegal entry and human trafficking will be among the areas of emphasis during Finland's EU presidency next year. Ch'amisûl, or Chamjinisulro as the manufacturer Jinro calls it. 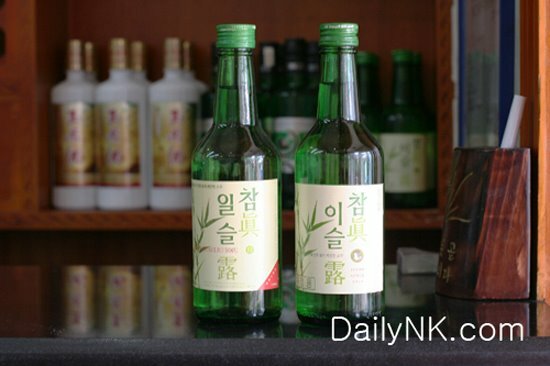 Ch'amdaesul in display among North Korean liquors in the Chanamsan inn (yôgwan) in Kaesong (via Chosun Ilbo). Dr. Lankov reminded that a story in Daily NK mentioned the Chinese Ch'amilsûl as one of the Chinese bootleg products. What was it, "imitation is the best form of flattery" or what? Ch'amilsûl on the left, Ch'amisûl on the right. Linked from Daily NK. The one week conference and vacation trip to Yorkshire in UK became a three week hiatus in blogging. For those who've been visiting meanwhile only to see the old messages without any hint of resuming the making of notes, a small apology. I searched some, and found the following, which should be Jo Jung-rae's introduction to his 12-volume novel Arirang, in which he depicts Korea under the Japanese colonialism/occupation. How many Jews were killed by the Hitler government of Germany during the Second World War? According to the Jews the number was three or four million. So how many of us Koreans were massacred and killed by the Japanese during the 36 years of Japanese colonialism? Is it three million? Or four million? Or is it six million? Unfortunately that estimate has not been made public or official. My estimate is between three and four million. With the writing of Arirang, I am going to make that figure concrete. That task is one of the objectives of writing Arirang. With the fact that three or four million of us Koreans were killed by the Japanese, I'll present a question to the readers and to the whole nation. A school class of 60 children are getting five lashes on their palms. Which child of the 60 feels the most pain? I have made this question to several people, and all have immediately answered that it's the first child. But it's a wrong answer. The correct answer is the last child. It is because the first child is freed of the fear of lashing after receiving the strokes and can be at peace while the other children are lashed. However the 60th child has to feel the fear each time the children before him are lashed. A hint for this answer can be found also in a proverb. "The one who is caned first is the luckiest." The Jews were killed on for three years, but Koreans were killed during a period of more than ten times of that, 36 years. Which people suffered more? Even though we suffered horrors ten times more than the Jews, how is it possible that we still don't know many of us Koreans died? And how do we feel the tragedy of another people, Jews, as if it was our own and detest the German army while wanting to avoid talking about own tragedy, forgetting and avoiding it? Was it because the times were different? Or was it different? When naked Jewish girls were dying in gas chambers, the girls of our people were getting gang raped in Southeast Asian jungles as troop following corps in a similar manner. So how have we become such ignorant masses? We have been subjected to two kinds of mass hypnosis. First, we have been hypnotized by the Jews who have made numerous novels, movies and TV dramas to tell about their suffering for the whole world. Second, we have been hypnotized by the pro-Japanese, who seized every sphere of the society after the liberation and with their organized plot have made the talk about Japanese occupation sound ignorant and stupid. Jews have maximized their suffering and while securing their self-esteem, and have used it as a power to develop their future. In reverse to them, we have been guilty of living in shame. But to know the history correctly, nothing is too quick or too late. Because nation is immortal. July 1994, Jo Jung-rae. 제2차 세계대전 동안 독일의 히틀러 정권에 의해 학살된유태인들의 수가 얼마나 될까. 유태인들이주장하기로는 3백만이라고도 하고 4백만이 라고도 한다. 그럼, 우리가 일본의 식민치하 36년 동안 일제의 총칼에 학살당하고 죽어간 우리 동포들의 수는 과연 얼마나 될까. 3백만일까? 4백만일까? 아니면 6백만일까? 그러나 불행하게도 우리는그 어림숫자마저도 공개되어 있지않고, 공식화되어 있지 않다. 나는 그 어림숫자를 3백만에서 4백만으로 잡고 있다. 그리고 작품 을 써 나가면서 그 숫자를 구체적으로 밝히고자 하고 있다. 그 작업은 을 쓰는 여러가지 목적 중의 하나이다. 우리 동포들도 일제의 총칼 앞에서 3,4백만 명이 죽어갔다는 사실을 전제로 나는 독자여러분들과 전체 민족성원들에게 한 가지 질문을 하고자 한다. 한 학급 60명이 손바닥 5대씩을 맞아야 하는 단체기합을 받게 되었습니다. 그 60명 중에서 가장 아픈 사람은 누구이겠습니까? 내가 그동안 몇몇 사람들에게 물어보니 대뜸 1번! 이라는 답이었다. 그러나 그건 틀린 답이다. 정답은 60번!이다. 왜냐하면1번 학생은 제일 먼저 5대를맞고 나면 매의 공포로부터 완전히 해방되어 그 뒤의 학생들이 매를 맞는 동안 자유를 맘껏 누릴수 있다. 그러나 60번 학생은 자기앞의 학생들이 맞을때마다 59번의 공포에 시달려야 한다. 이 답의 힌트는 흔란(?) 우리의 속담속에 있다. 매도 먼저 맞는 놈이 낫다. 유태인들은 단 3년 동안에 죽어간 것이고, 우리 동포들은 그 10배가 넘는 세월인 36년에 걸쳐서죽어갔다. 어느 민족이 더 괴롭고 고통스러웠겠는가? 유태인들보다 10배가 넘는 공포에 시달리고 고토을 격었음에도 불구하고 우리는 어찌하여 아직까지도 우리 동포들이 얼마나 죽어갔는지를 모르고 있는 것인가? 또 어찌하여 다른 민족인 유태인들의 비극은 마치 우리의 일인 것처럼 실감하고 분노하며 독일군들을 증오하면서도 정작 우리 자신들의 비극에 대해서는 이야기 꺼내는 것은 역겨워하고 지겨워 하고, 망각하려 하고 기피하려 하는가? 그 시대가 달라서 그러는가? 과연 그 시대는 다른가? 유태인 처녀들이 발가벗겨져 독가스실에서 죽어갈 때 우리 민족의 처녀들도 동남아 일대 정글에서 정신대로 윤간당하며 죽어 가고 있었던 똑같은 시대다. 그러면 우리는 어찌하여 그런 어리석은 군상들이 되었는가. 우리는 두가지 집단최면을 당했던 것이다. 첫째는 자기네들의 수난을 전세계적으로 알리고자 수없이 소설을 쓰고 영화를 만들고 TV드라마를 만들었던 유태인들에게 우리는 최면당했다. 둘째는 해방과 함께 우리 사회 모든 부분을 장악했던 친일파들의 조직적인 음모로 일제시대는 망각이 최선이고, 일제시대 이야기를 꺼내는 것은 촌스럽고 모자라는 짓으로 매도되는 최면을 당한 것이다. 유태인들은 그들의 수난을 극대화하며 자기네 민족의 자존을 확보하는 동시에 미래를 개척하는 민족의 동력으로 삼았다. 그런데 우리는 그들과 반대로 살아온 부끄러움을 저질렀다. 그러나 역사를 바르게 아는 데는 시기의 빠르고 늦음이 없다. Now Jews should know they should be lucky that the holocaust took place only within three years, in addition to bearing the partial blame for the Koreans' ignorance and shame of their own history. According to Mrs Chông, her husband wasn't suited for working under others, so his company employment turned into driving a taxi when the young family moved to Seoul soon after the marriage. Her husband did not oppose her work at the time of their marriage. "My husband knew that I was a hairdresser when we were getting married. And the man has to be capable (nûngnyŏk) if he is going to be against it. Those who don't have nûngnyôk usually don't oppose because in that case also the woman has to earn. My husband is of a helping and cooperating sort. He cleans here in the morning." In an earlier occasion she had compared to herself to her husband saying that she had a lot of saenghwallyôk, that she earns money.